Mesh is a library that gives you the utilities needed to build a sophisticated messaging layer that facilitates remote, and local communication for your application. Server-side and client-side. Think of it like underscore for data. Mesh is just a bundle of helpful functions that make it easy to write explicit and flexible data handlers. 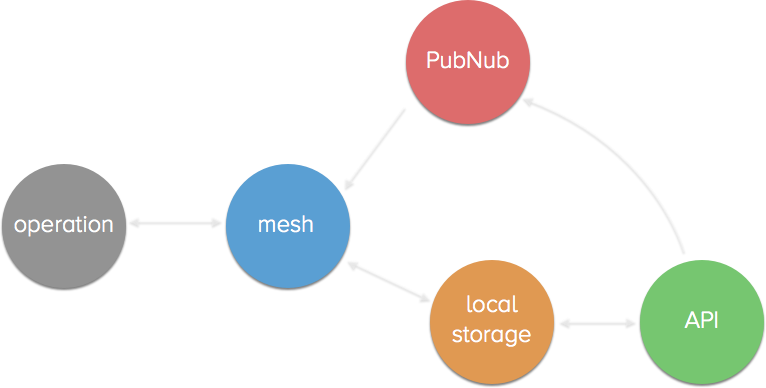 Use it with any framework on any platform - Mesh should be complimentary to your existing application stack. // back to local storage. // broadcasted to all connected clients. Mesh is unopinionated. Use it to bring sanity to even the most complicated APIs. Write highly testable apps that work with any database, any API. No more vendor lock-in. Write complex features with ease. Connect services together such as socket.io, and local storage to build things such as realtime data, rollbacks, offline mode, and more. Checkout some examples of what you can build with Mesh.